The OEM Subaru crank pulley has been a cause for concern ever since its original design. It is extremely heavy, susceptible to catastrophic failure, and quite unsightly. Continuing to use this on our cars just wouldn’t do. Eliminating rotational mass while maintaining a safe presence can increase reliability and bring faster Rev’s! 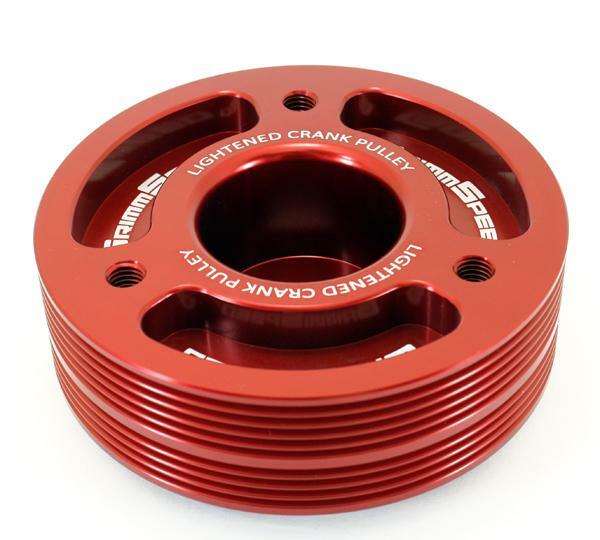 For our Lightweight Crank Pulley we pulled out all of the stops. CNC machined from 6061 T6 Aluminum our pulley makes no compromise. It weighs in at 3.5lbs lighter than OEM while at the same time increasing its durability. Marked with a timing mark and perfect cut keyway makes this install a breeze. We designed the pulley with the optimum weight for performance while avoiding misfire CEL’s and engine hesitation. Here at GrimmSpeed innovation is the standard with every product we release and our pulley is no exception. We have designed the only aftermarket pulley installation and removal tool that works with each style of OEM Subaru pulley as well as our aftermarket lightweight pulley. To take it one step further we have also designed the only compatible aftermarket stretch belt installation kit for all 2008+ Subaru Models. Includes OEM timing marks for timing verification.